Rebecca Joskey was born in Tulsa, Oklahoma. She’s a baby boomer, educated in Oklahoma and New York. Her career of 40 yrs has focused on fashion, design, art, retailing, and merchandising in Baton Rouge, NYC, and Tulsa. Her “paper mosaics” and collages are made from techniques from both painting and the craft of mosaic art. This style of art combines underpaintings on canvas with applied painted papers to create rich tapestry like abstract pieces. Joskey’s work is intuitive and loaded with playful content supported by sincere and bold color work. Acrylic, cardboard, tissue, oil pastel, gunpowder, tile, monoprint papers, and slate are amount the materials that weave and unwind through the themes in her work. Urban Art Lab Studios is a planned “encore career” project of Joskey’s that mixes her love for mentoring, business, art, design, and painting! 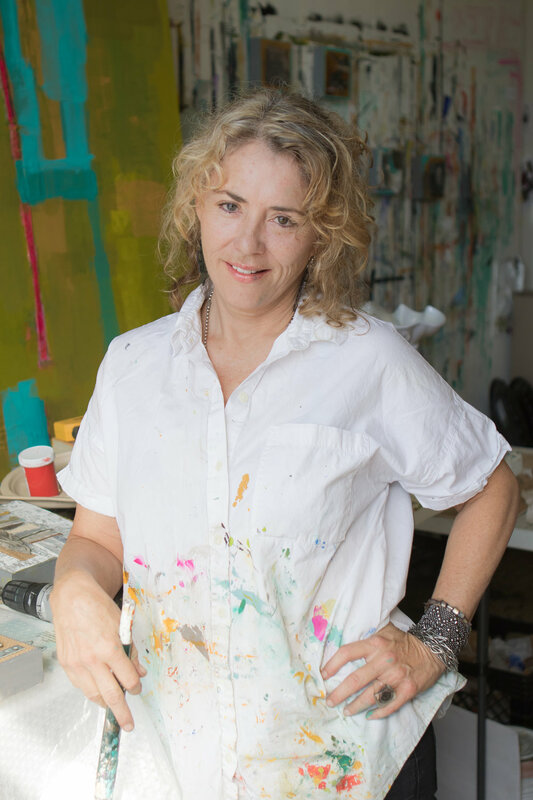 Her work has been shown & sold at M A Doran Gallery, MOREcolor Gallery, Mayfest Gallery, TAC, 108 Contemporary, Living Arts, and of course at Urban Art Lab Studios’ Gallery which celebrates its 4YH anniversary April 2018. Urban Furnishings is nested inside UAL. She credits Looney Tunes, Camp Fire Girls, and having a “free range” childhood for developing an artistic attitude and ability to observe.